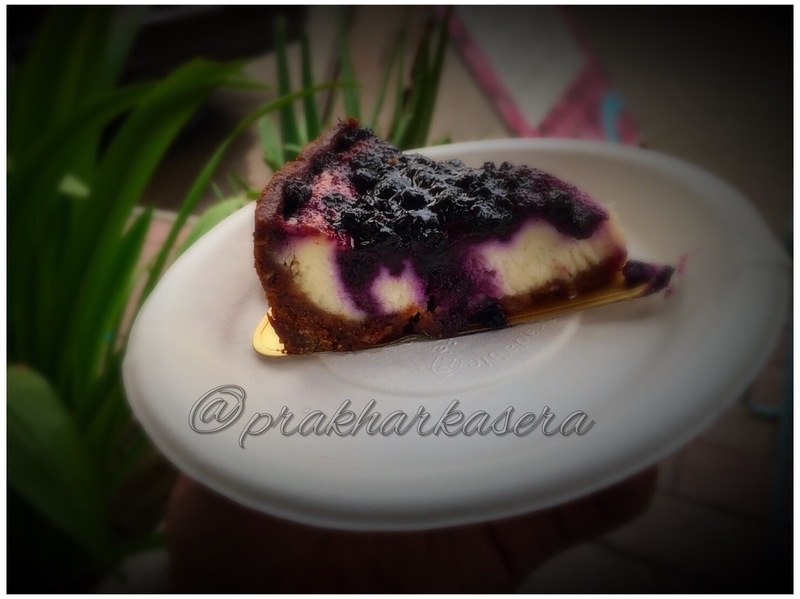 Hyjack is in Safdarjung Enclave Market of South Delhi. Market does have a few good chill out zones, one of them in this one; Hyjack. Its been just a couple of months since the launch of this lounge. Since the launch was extremely successful, the hopes riding on this place are very high. Its in the Cross Point Mall of Gurgaon in Dlf Phase 4. 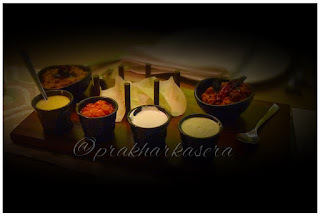 They serve North Indian and Continental cuisine food, but nothing authentic, all fusion and thats the best part. Fusion food is very much in, it tastes well, is presented well, chef can play with ingredients and spices & there won't be an easy flaw to point out in the dish. Also, there was one thing that I don't remember I have seen or heard anywhere before i.e barrelled cocktails. They had barrelled several cocktails, which we knew about just the straight drinks, or scotch whiskey to be specific. Petit Gouda Naan: Mini naan with gouda cheese stuffed in them, and served with home made onion chutney. Probably the best thing I had was this, had to order another portion of it, one just cant get enough of it in one portion if sharing with someone else. The onion chutney served with it made taste much more succulent. Pesto Flatbread: Basically it was a pizza, cut into slices and served as a flat bread with the toppings of sun dried tomatoes, jalapeños and crispy onions with cheese on it. This too was very much luscious. 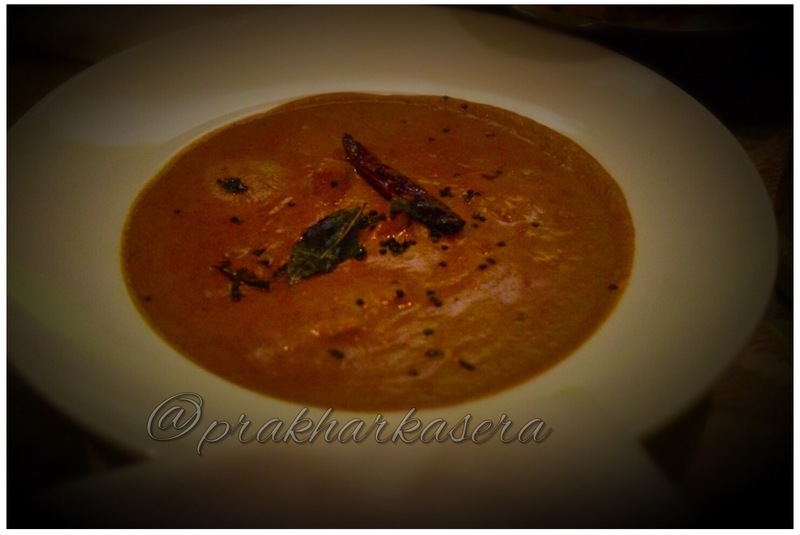 Kokum Curry: Cooked in coconut gravy with stir fried vegetables in it. 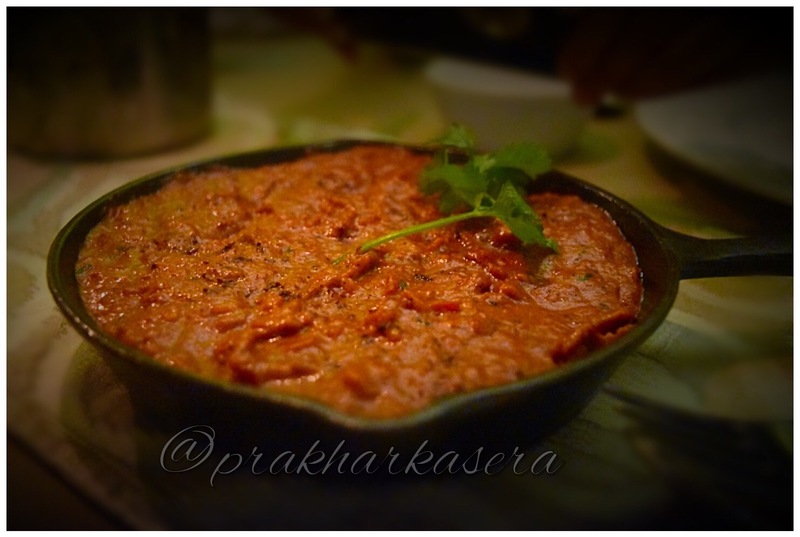 It was served with malabar paratha, one of the best breads to have with such curries or any curry whatsoever. Crunchy Papardelle: This is a fusion of pasta with mushroom and truffle oil on top. It also had crushed papad toppings on it and was also presented with the same crushed papad surrounding the pasta in the platter. But, honestly, the idea of this didn't sounded much tempting, though it was too good to have. The flavour and the essence of sauces and oil in the pasta were very strong and gave it an extra edge. Detox Retox: This was gin based cocktail, gin used by them in it was "Gordon's". Other than that, the infusions in it were of citrus, black pepper, turmeric and tonic water. Opposite Attract: Tequila and red wine based cocktail with lime and bitters infused in it. It had mint leaves decorated on top and blackberry on top in a dessert spoon. And so I was here at Diva Spiced, Lodhi Road, Finally!!! Its situated in the meherchand market. Had tried out their other restaurants in GKII, Khan Market, Sunder Nagar by the names of PDA, Latitude, ATM respectively and I have had amazing experiences their in the past. But one thing that all of those are Italian Cuisine restaurants, while this one here is a Chinese, Pan Asian Cuisine restaurant. They absolutely nailed it when its about the food. Its not like that their services lacked anywhere, but the food, the main part played its role. Stunning ambience, great hospitality, the food presentation everything was just near perfection, won't say perfect cz their's always some room for improvements. While I was here for a dinner, I had quite a meal. I started with a Tomato consommé with the fragrant of lemon grass served with glass noodles and fresh cherry tomatoes. It was oozing the quality of a clear soup, though the black pepper in the soup got me. This was followed by the dumpling "roasted pumpkin, shiitake and truffle oil". There was a red quinoa salad with goji berry and popi seed dressing, a small plate of taro and water chestnut satay. Then we started the main course with probably the best dish of the evening i.e "Yam and Lychee curry with Cheddar Bao". The Bao had the filling of cheddar cheese in it and the curry, damn good curry it was. I might not have had a better curry than this. There was one more dish that I had there for the evening before going for the desserts, and it was "Tofu steak with lemon coconut sauce, grilled pineapple, Burmese coconut rice". It would had been better if we had that bao later as this dish here was succulent but couldn't leave a mark as we already the best of the lot. Also I personally don't have a taste for coconut. Now for the desserts we opted to try a several few of them, we had black rice pudding, chocolate panache with sesame gajak & honeycomb ice cream, japanese cheesecake with apricot glaze and puto, coconut jelly & dalle-infused pineapple. 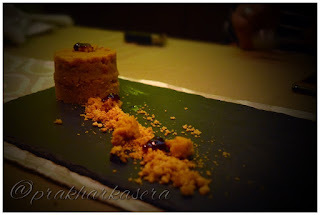 Not a big fan of sweets I am, but I liked the chocolate panache with gajak. On the whole, it was a nice evening with some delicious food. Definitely coming back here. Sector 29 in Gurugram, the place is famous for the numerous bars and breweries it got. That particular locality is now the most trending area amongst the youth of not just Gurugram but the whole NCR. The growing trend of house breweries in Gurugram has led the particular location getting so many options. Now, being the hub of bars, there's one by the name of 21 Shots. 21 Shots is a bar and casual dining place. Its on the first floor of the building. The ambience of the place is sensational. For interiors, lighting was neither too dim nor too bright, seatings were congenial. One enters the place, the first sight would be of the bar and then seatings arranged on either side of the lounge. Food was toothsome, as for drinks cocktails couldn't live up to the expectations. The bar was set by the food, it was exceptionally good, just the drinks couldn't match the bar but anyways, all in all the whole experience was breathtaking. Q: What I had there ? A: I had a some starters, followed by the main course and then a dessert. The whole meal was accompanied by a few drinks as well. 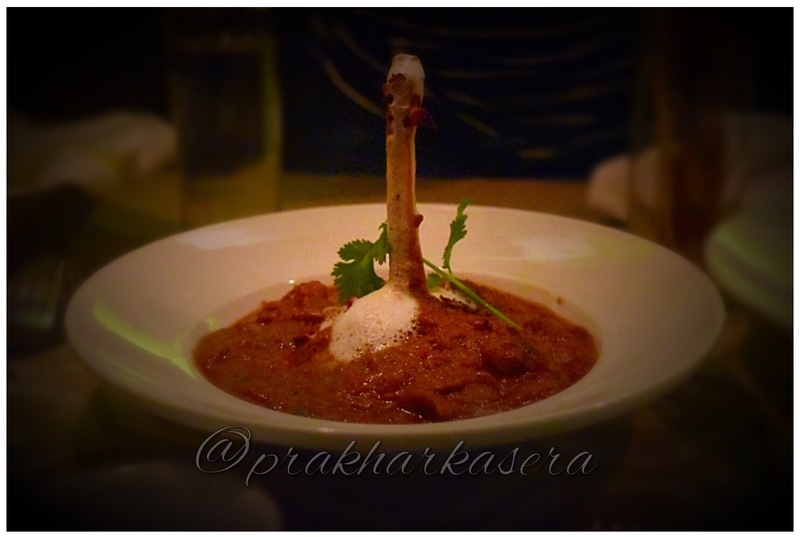 For the mains, I opted to stick to the basics only, so I ordered one Dal Tadka and Paneer Makhani. And to complete the meal there was Chocolate Brownie with Ice Cream. For drinks I had a couple of beers and one old fashioned. I tried a couple of the cocktails too, but as mentioned above, I opted for the classic ones. Played safe and ordered one old fashioned (all time favourite and the safest to order) and a couple of beers. Snacks and savouries, cakes and pastries, thats what bakes a bakery. Other than this, you get to enjoy shakes and ice creams too at a bakery. Though there are several more items thats sold by the bakeries, but those mentioned products would be the most sold bakery items for the neighbourhood. Besides these, a bakery also sells cookies, bagels, tarts, crackers, pretzels etc. All the flour based items that are baked to eat are sold by a bakery. The concept of baked food is thousands of year old. It started from Europe and expanded to other parts of the world. Now there are uncountable bakeries all over the globe, so is the one, “Bliss Bakery”. Bliss bakery is a small bakery, they have their outlet in the M block market of GK1 locality in New Delhi. The bakery has varied options to chose from. They got cakes, pastries, ice creams, hot & cold drinks, snacks, savouries etc. For the ones who got the sweet tooth, this is a lovely place to be. Though they don't have much of a seating, but they do got incredible taste in their bakes. People here are mostly for takeaways or having a quick bite. I was here, unsure of having the snacks hot n fresh, there only or having it parcelled for home. Going through the options, I opted to have them then and there only so as to try the most of them for what I can and also the food tastes best when served hot n fresh, so getting them parcelled may not impress me as it would if I have them fresh. I started with pita bread with dips, hummus was in the jar, so having the hummus and pita bread was resulting in loads of hummus on the bread. Anyways, who doesn’t like hummus, the more on bread the more succulent it gets. only. They are the house bakers, so the breads had to be fresh and so were they. What's left were the cakes, the pastries and ice creams. There were lots of options to try from. I also had a dark chocolate dairy free sorbet, a red velvet cheese cake, banoffee tart and raspberry almond tart. I had a wonderful time and some toothsome bites. P.S. They do home delivery as well. Tashan is a fine dine restaurant in GK II, M block market. The cuisine served here is North Indian. I have been here quite a few times, and still visit the place for the obvious reason, their succulent food. And so I was here again, for some quality dinner of course. They have kept the ambiance pretty plain and simple. There service has improved a lot and thats a good thing for them. 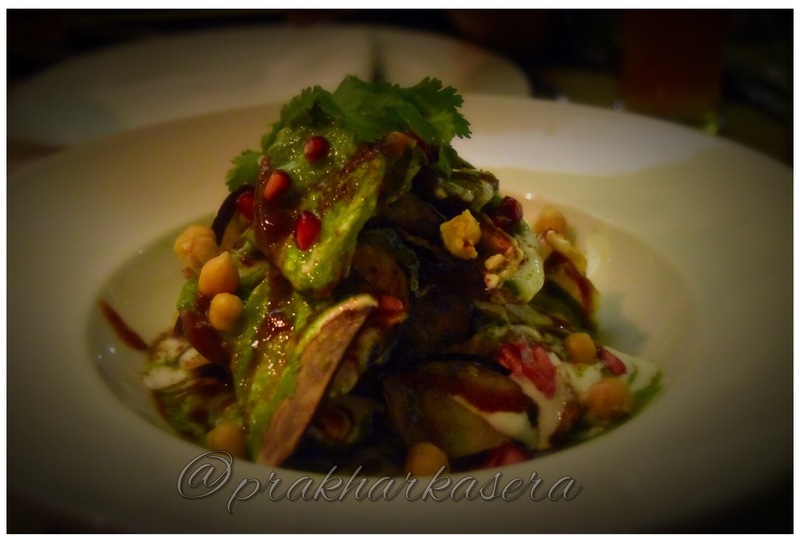 Baingan ki chaat: A very good option to start with, those crisp auvergne chips in the chat had a too good impression to relish it and the whole dish is brilliantly made. 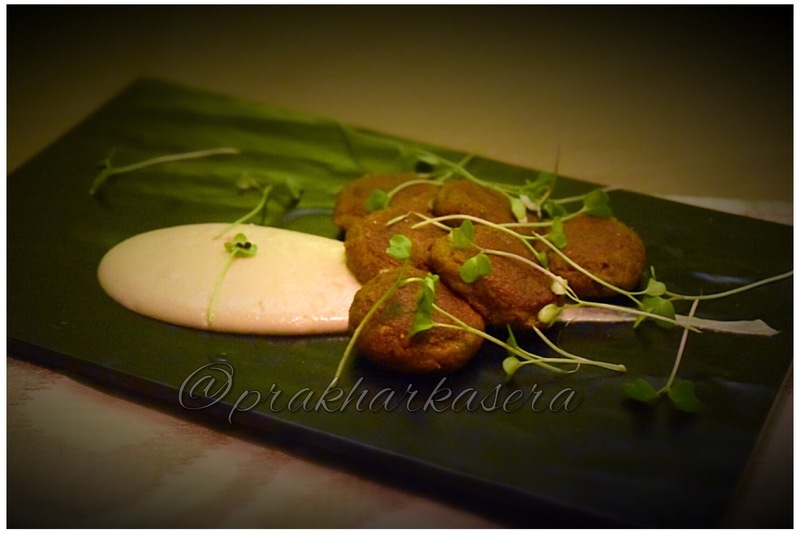 Mushroom galouti kebab: Kebabs were good, served with some yoghurt chutney. Also I had veg tacos served with four different dips, the filling in tacos, dips and the bread itself was very good. The filling was served separately to fill in as per the quantity of fillings we want in it. 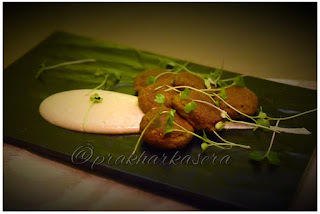 Other than this I already had beetroot ki tikki in the past, which was amazing, this one also goes for my must haves. Paneer hungama: This dish for the main course is very amazing, paneer with stuffing of indian herbs in it. Dal makhani and nadru kofta are the other dishes I had for mains. For desserts I had bhuni roti ka halwa, baked yoghurt and baileys kulfi. 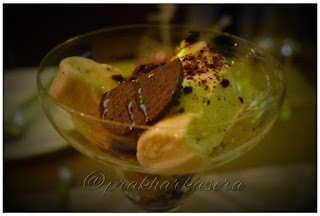 Baileys kulfi, is a must try, its very amazing and definitely not the one to miss. Bhuni roti ka halwa was also good, it had a base layer of bhuni roti then flour halwa on top, eating both together made the taste unique and extra sinful. Baked yoghurt had honey on top to do the work of sweeteners. For breads I had garlic naan and lachha paratha. I remember methi paratha and caramelised kulcha I had here previously. 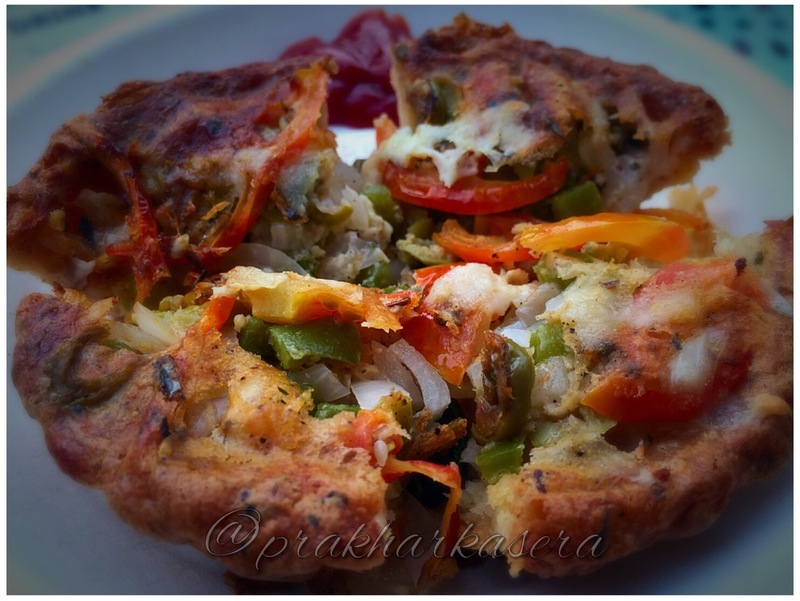 Caramelised kulcha was something very different and makes the must haves list. The best part is that every ingredient is being prepared by them in house only.